Once | Walsh / Hansard / Irglová :: TicketServices.gr " // + "
The multi-awarded musical Once, Broadway's absolute triumph, comes for the first time to Greece, as a major production of the Greek National Opera Alternative Stage. Written by Enda Welsh, with music and lyrics by Glen Hansard and Markéta Irglová, Once is based on the motion picture with the same title, scripted and directed by John Carney. A modern love story is brought to life on stage through wonderful songs, such as the Oscar winning “Falling Slowly”, and an excellent cast of talented actors, musicians and singers of the younger generation. A hymn to the faith in dreams and the power of music, directed by Akyllas Karazisis. The leading roles are performed by the charismatic Marina Satti, who has astonished everyone in the role of Aretoussa in Dimitris Maramis' Erotocritus, and the experienced performer Apostolis Psyhramis. Marina Satti is the new star of our time, with millions of views on Youtube, involved both in large musical productions and improvisation performances with the project Fonέs. What's interesting about the Once musical is that the actors will also take on the role of the orchestra musicians and will perform live music on stage. The Once musical, written by Enda Walsh, is the theatrical adaptation of the awarded movie that was directed by John Carney in 2007. It tells the love story between an Irish musician and a Czech immigrant woman in the streets of Dublin. The film is a tribute to classical musicals, written in modern language, that has been honoured with the Audience Award at the Sundance and Dublin festivals. Like in the movie, the music is by Glen Hansard, singer of the Irish rock band The Frames, and the lyrics by the Czech singer, pianist and actress Markéta Irglová. Their song, “Falling Slowly”, recorded by The Frames and performed by the two artists as a duet on stage at live shows across Europe, was a huge success and won the 2008 Academy Award for Best Original Song. The musical premiered at the New York Theatre Workshop theatre in 2011 and a year later it was remounted with great success on Broadway. The production received 11 Tony Award nominations in 2012 –an institution that rewards the best Broadway productions since 1949– and won eight awards in total, among others, for Best Musical, Best Actor and Best Book. In 2012, the musical won the Drama Desk Award for Outstanding Musical, while in 2013 it was awarded with the famous Grammy for Best Musical Theatre Album. At that time, it also became a theatre production for the first time in London, while in October 2013 it went on a grand tour in America that continued in 2016 as well. 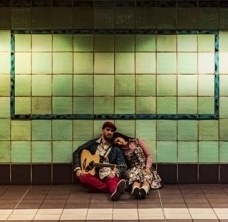 A busker in Dublin is ready to give up his dreams, when a young Czech musician, an immigrant woman in Dublin, shows a sudden interest in his obsessive love songs. As the attraction between them heats up, the artist's musical inspiration reaches its apogee… However, their unusual relationship proves to be deeper and more complex than just any simple everyday romance. It is a moving, unique story about the faith that we need to have in our dreams, and the power of music that connects us all together!